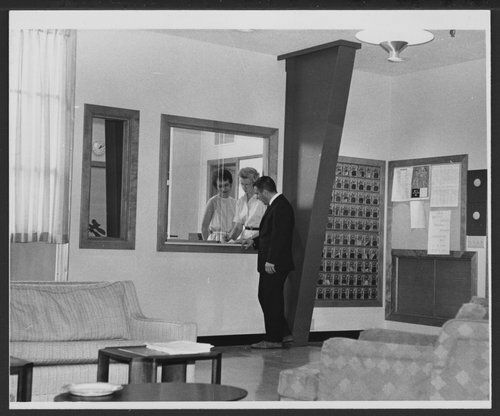 The six black and white photographs of rooms show various interior views of the rooms and arts and crafts activities in the newly constructed Rosenberry Activities Therapy Building. The Menninger Clinic philosophy of treatment was the bio-psycho-social approach. This philosophy of treatment integrated medical, psychodynamic, developmental, and family systems to treat the total health of patients. The people shown in the rooms are Menninger staff members. The photographs were taken by The Week Ahead, a weekly patient newspaper.